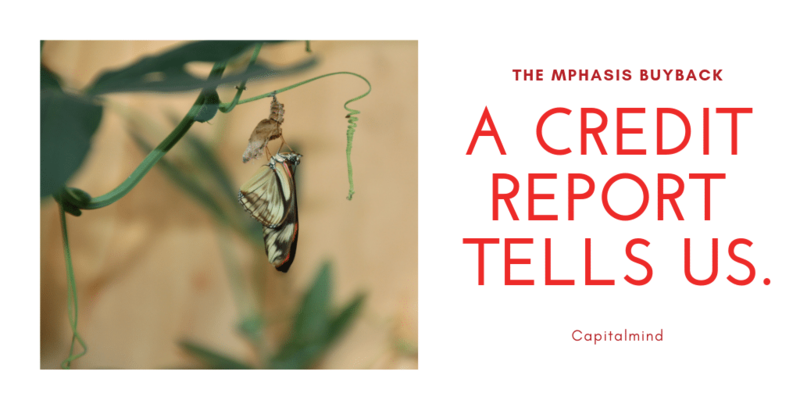 On our experimental and corp-actions-and-ipo channel at Capitalmind Premium, we recently had an interesting discussion on the buyback announced by Mphasis. Mphasis came out with an announcement on 2nd October, 2018 that they are planning to buyback its equity shares at Rs. 1,350. (The stock currently is at Rs. 920) The record date for tendering shares is over, so you can’t buy now and submit for the buyback as you won’t qualify. Now, this is likely to be one of the many buybacks that Mphasis will announce in the coming years, and possibly very heavy dividends as well. How do we know this? MPhasis was bought by Blackstone recently from HP at a price of 450 for about $1.1 billion. Blacktone is big and has enough money, you would think. But they financed half the deal through a bond market offer. The promoter of Mphasis is a company named Marble PTE II Ltd. which is owned by Blackstone. The bonds were supported from Mphasis ensuring a steady payout in the form of dividends and share buybacks. However, this might not be very hard for Mphasis since it benefits from access to its ultimate parent’s, Blackstone Group, portfolio of customers. In addition to that, Mphasis has a committed order book for over 5 years with HP. Effectively, HP pays $990 million to Mphasis from 2017 to 2022, and then will further renew the contract three more times, 2 years each – for a total of 11 years. The bonds need an interest payment of 5.3% of 500 million = 26.5 million USD per year, which is around Rs. 200 cr. per year. How will this impact the future of Mphasis? Continued buybacks and higher EPS growth. Essentially this means that: MPhasis will have to keep generating cash to pay Blackstone around Rs. 200 cr. per year – this means dividends, or buybacks, every year until 2022. Either that, or Blackstone engineers the sale of Mphasis itself as a whole, which is likely by 2022. Back in September 2016, Blackstone bought HP enterprise’s stake in Mphasis for Rs.7,071 crore ($1.1 bn then) at Rs.450 per share. Later in May 2018, Blackstone sold Rs.1,500 crore worth of shares at Rs.960 per share. If MPhasis continues with a buyback every year of around 1000 cr. or so (the current buyback is 988 cr. and the previous one in 2017 was 1100 cr.) that would mean about 3,000 cr. worth shares bought back further from now till 2022, or around 15% to 20% of the company. Profits are likely to sustain, since HP’s given them $200m a year in revenue at least, and other Blackstone companies can be harvested as customers. Now, with the same profit and 20% less shares outstanding, the company’s Earnings Per Share grow by 25%. (Think of it – a 1000 rupee profit for 100 shares is Rs. 10 per share. But for 80 shares it’s 12.5 per share) Or, around 5% a year of “extra” EPS growth because of the buybacks. That was for an assumption of no growth. Any growth assumptions will then add to the earnings growth – so if you think it grows 10% a year, the EPS will actually grow 15%. Now, one of the participants pointed out that in Mphasis, the number of retail shareholders almost doubled in September 2018. It went from 2.2 lakh to 3.2 lakh in the last 3 months. On the other hand, alternative investment funds and mutual funds are selling their holdings. This probably explains the continuous drop in price. The shareholding statistics indicate 21,000 new shareholders in Sep 2018, and incremental shares of 17.46 Lakhs . Remember, only 73 lakh shares will be bought back, and retail reservation is 15% of that – about 10 lakh shares.Let’s assume that most of the new shareholders are focusing on the buyback, and if they are holding 17 lakh more shares, it means acceptance ratios will be much lower than 100%. Yet another participant was curious about the worst acceptance ratio that we can live with. We think it should be 50% – a trade purely focussed on the buyback would have broken even at a Rs. 900 price point. The general impression was that buybacks are overcrowded trades, and the failure of some recent buybacks even when data should have indicated full acceptance, reflected that. This particular buyback, isn’t likely to make people money, as the price remains at the lower end even if 50% of your shares are accepted. MPhasis is an interesting case because a fall in the share price can make the company even more attractive as there are likely to be more buybacks in this company in the next three to four years. Where did we get this information from? A credit report. Now credit rating agencies might largely be useless in the rating part of their offering, but credit reports do provide useful information on the business every once in a while. MPhasis is an 18,000 cr. company now, and generates around Rs. 1,000 cr. in profit a year. They’re likely to pay that out, and in all likelihood Blackstone will sell the company in the next four years. There is a potential special situation here, but readers are encouraged to look at the company in much more detail before they make a decision.